Using a 5-Stages of filtration, this Reverse Osmosis system comes equipped with a RO membrane that has proven to remove at least 1000 different contaminants from tap water; heavy metals, bacteria, and viruses included.Even though a good amount of water needs discharging to get equivalent pure water, the cost is still a cent to a bottle. This RO system gets you 50 gallons of clean water per day. Enjoy years of fresh, clean and tasty water in the convenience of your home with the APEC – Top Tier Reverse Osmosis System. Save money and time, and live healthier with contaminant free water. Make tea, coffee, ice, or just drink it straight out of the tap! This 5 stage filtration system eliminates 99% of impurities like toxins, sediments, fluorides, heavy metals like lead, arsenic and chromium and hundreds of other harmful substances and kills disease-causing viruses and bacteria. It also eliminates bad taste and odors, delivering water that is good to taste. In fact, this system is suitable for most types of water – regardless of the water pressure, pH balance or hardness level. Its automatic shut-off system ensures the unit shuts down when the tank fills up. This product is manufactured entirely in the US with the guarantee of quality, safety, and performance. The superior filters are sturdy, secure and durable and are easy to fix or replace; no extra steps or lock clips are needed for sealing leaks. Packaged with an all-chrome stylish faucet and certified food grade tubing, the APEC – Top Tier Reverse Osmosis System provides water that is absolutely safe, even for babies. The high-grade filters used in this product ensures extended longevity of the membrane and the unit as a whole. The low-maintenance filters only require replacement once or twice in a one year period. The robust, heavy-duty construction ensures several years of efficient, noiseless functioning. The Do-It-Yourself design allows you to install easily, maintain and even troubleshoot this water filtration system. Its design also conforms to industry standards, so its parts are versatile and are compatible with others available in the market, and can be easily upgraded. This product has a rating of 4.8 stars out of 5, with most consumers being very pleased with the ease of use and the water taste and purity. It is ranked at no.3 in the Top 5 list of Best RO systems in the US. 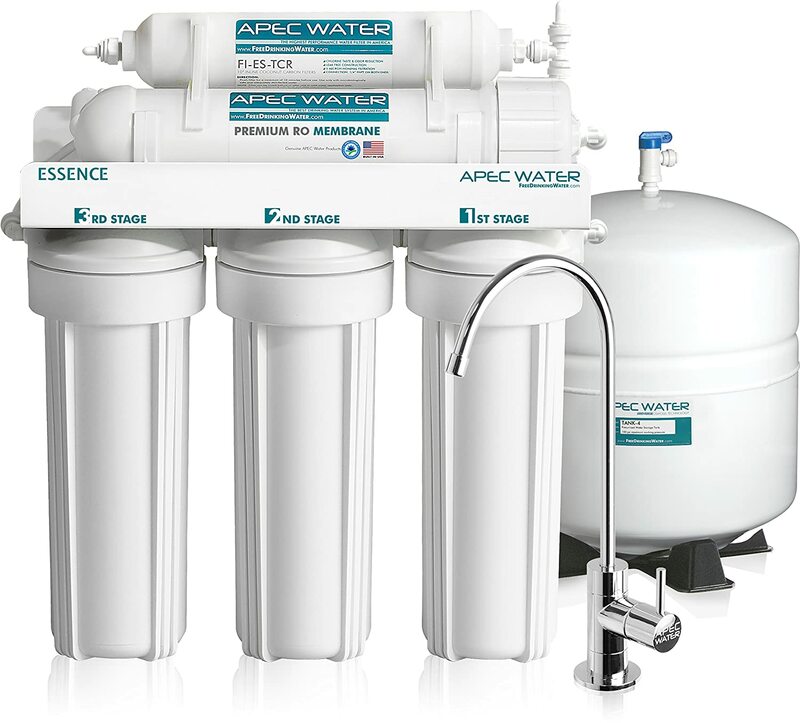 The APEC – Top Tier Reverse Osmosis System is the product for you if you’re looking for an excellent, thorough filtration system at an affordable price. You will never have to worry about the safety of the water you drink with this unit installed at home. Thank you for the information of the reverse osmosis system. I hope to learn a few tips from this your reverse osmosis system. Make friends with me in this site. I and you will exchange some information on reverse osmosis system. Thank you! Wow this Apec system really does look like a great Reverse Osmosis System and it has a lot of great reviews as well, so you know that it must be good. I’m going to start saving up for one of these and buy it next week. I have also recently just started using a Crystal Quest Shower Filter with some good success for filtering out the chlorine and heavy metals from my home’s water supply.